From the outside, Coley Sterling’s life seems pretty normal . . . whatever that means. It’s not perfect—her best friend is seriously mad at her and her dance team captains keep giving her a hard time—but Coley’s adorable, sweet crush Reece helps distract her. Plus, she has a great family to fall back on—with a mom and stepdad who would stop at nothing to keep her siblings and her happy. But Coley has a lot of secrets. She won’t admit—not even to herself—that her almost-perfect life is her own carefully-crafted façade. That for years she’s been burying the shame and guilt over a relationship that crossed the line. Now that Coley has the chance at her first real boyfriend, a decade’s worth of lies are on the verge of unraveling. 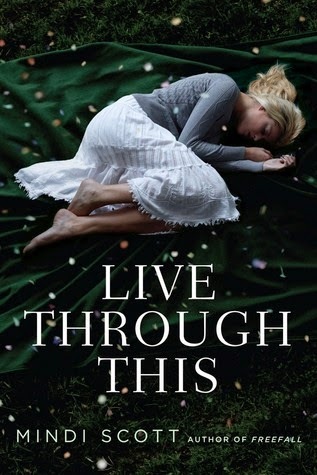 In this unforgettable powerhouse of a novel, Mindi Scott offers an absorbing, layered glimpse into the life of an everygirl living a nightmare that no one would suspect. I picked this book up because of the amazing review written by Cassie Conant over at Good Books & Good Wine and I just knew I had to get it right away, I'm so glad I did. Please also read Mindi's letter explaining why she wrote the book, I didn't read that letter until I was writing this post, so I wasn't aware that I had gotten everything she was trying to share without knowing the background. I'm issuing a TRIGGER WARNING. Also I know in the video I kept saying Cordy, I'm not sure why Coley became Cordy but it's there. LOl oops. This is such a raw, and devastating look at abuse. I loved that Mindi went into the book from a different perspective on abuse, This books is extremely character driven, it's about Nicole's reaction to her abuse and her interaction with the world around her. It's more about Coley/Nicole instead of a big event. It's not until Nicole names her abuser that we even have a hint of who it is, that's how well Mindi wrote the book. I was just so devastated for her, and the concept of how it started and why it started. I started to panic along with her when I realized that the abuser was starting to groom another victim. We drop into her life with the abuse has been happening for eight years and she's struggling to hold on to her sanity. It's easier now because it's not as frequent but holidays are always tough. Telling is going to change everything and she's not sure how to handle it. There are so many ways the story could go. We're not sure how the Mother will react but we do know it's going to be tough as shyt. All of that and she's trying so hard to fit in with her peer group/friends, her dance team and her former best friend. Coley's life is full of people who want some part of her, but no one is seeing the pieces that have been stolen. It's sad, raw, filled with enough angst that teens would get the high school drama, but it still gives a good story that's a good discussion piece. This ending reminds me of Speak by Laurie Halse Anderson, we are left to wonder how it all goes down. I loved this book, I will be getting my own copy since I borrowed this one from the library.